Toys R Us is–after several months of liquidation and such–closing officially. My final visit was the other day–Wednesday, June 27. It was the Mentor, Ohio store–across from the Great Lakes Mall. 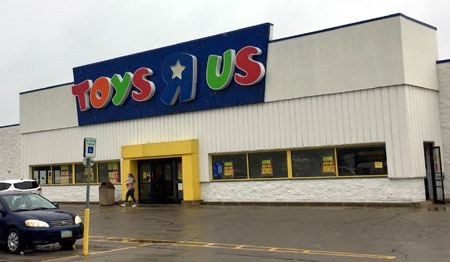 This was the first Toys R Us that I remember…and in many ways, the most important. At least, to me. This was the TRU that I got my very first Teenage Mutant Ninja Turtles figure–an original Rocksteady (that has, unfortunately, been lost to the passage of time). This was the TRU where I got my Dino-Riders figures. This was the TRU where a friend and I loaded up shopping cards with clearance Star Wars Episode I toys one friday evening after we’d just gotten paid for the week, back in the summer of 2000. This is the specific TRU where I got some Marvel Overpower starter decks and boosters; where a friend and I once debated whether or not and which of us should go back in to try to ask out the cute cashier. I specifically remember getting the mutant fly of the original TMNT line–Baxter Stockman–at this location. I remember seeing some of the Marvel Onslaught/Heroes Reborn figures here. I bought my X-Man (Nate Grey) figure here. I got my very first figure of the TMNT 2012 line here–a lone Donatello figure, and that was the only figure they had out that first visit. I bought my Herocscape boardgames at this store. And I made my two largest/most-expensive single-item toy purchases of my entire life at this store. 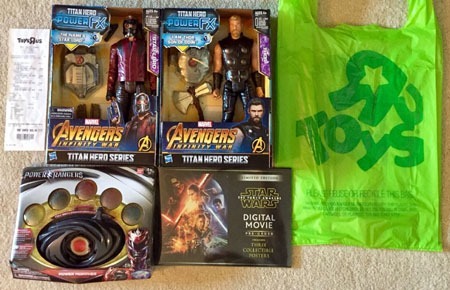 Over the years–while yes, I’ve bought plenty of toys from places like Target and Walmart, even the occasional online purchase–Toys R Us was THE place to go for toys of pretty much any sort. Maybe it’s the “looking back with rose-tinted glasses” of memory, but I feel like even when I had complaints about pricing, Toys R Us was consistent and always there. 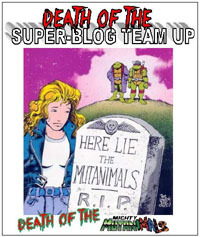 They would have that elusive Pop, that elusive TMNT figure, the elusive Marvel Legends figure. They would have chain-exclusive stuff, made specifically for them…and there was plenty that they would have exclusively, because they were the only place that would give something a chance. Maybe most notably for me, the TMNT Classics line–reproductions of the original 1980s figures. While I eventually did find most of my ORIGINAL-originals, the reproductions filled things out. No other toy chain stocked this line–you could NOT get it from Walmart or Target or such. And I never stopped going to Toys R Us. I wasn’t there every week, or even every month…but I was in there frequently. While maybe not every week or month, there were times that I’d be in this particular store a couple times within a week. And some times that I might make “the rounds” and visit not only the Mentor location, but other relatively-nearby locations. Beyond Mentor, there was one in Mayfield Heights that I’d go to here and there. Rarely specifically, but when I was already in that area for Half-Price Books or Microcenter or some such, I’d stop in. There was one in Fairlawn/Montrose not far from where I worked for a time that I visited a number of times. In July 2016 specifically, I remember zipping over to that store on a lunch break to get a Charizard figure for my desk shortly after Pokemon Go hit–also not knowing I was a couple weeks away from being laid off. There was one in Cuyahoga Falls that I went to most during my grad school years and then living in the city itself for another 8 years until being laid off. This one was across the street from a Target, and about a 5 minute drive from my apartment, so it was easy to get to just to “see what they have” at any given time. Back in 2009, after securing our tickets for the new Star Trek film, my roommate and I went in and between the two of us, bought the entire line of figures, along with a couple overlaps. There was another Toys R Us over in Sandusky that I’d been to a number of times with a couple of different friends that live near there. There was one in Toledo that I got to a handful of times during college, and where I got my 2003-TMNT turtle van. I remember on one visit to Toledo leaving several friends at the mall, driving to TRU myself because I was the only one that wanted to go in, and then meeting back up with my friends at the mall afterward. So very many other memories I could dig up if I tried, and had the time. Maybe it’s sentimentality. Maybe it’s my weird memory or the way my mind works, associating people and events with places and physical spaces. I believe I would have been “introduced to” Toys R Us at least by 1988…and my earliest conscious memory of the store was that first TMNT figure, which I believe would have been sometime in 1989…so that late-1988 until whenever it was specifically in 1989 is a bit fuzzy. But give or take a few months to a year…nearly 30 years. Ultimately–for me–it ended with a whimper. With a final $11.77 including sales tax. Two talking Titan Hero Series Avengers Infinity War figures–Thor and Starlord. A 2017-Power Rangers movie morpher. And a poster kit of some sort from a “pre-order” of the digital Star Wars: The Force Awakens…purchased for the posters, zero regard if it includes a digital movie code or not (I’m assuming it does not). My final time in the Mentor store, it was just the entrance-area atrium and the front main aisle. Everything else was taped off…and a good 3/4ths of the space even there was empty, bare shelving. The Power Rangers morpher was on a shelf slightly into what used to be the videogames and such area–but otherwise that area was taped off, too. I felt bad–like some vulture picking over the bones of something that used to be fuzzy and cute. This final time, I wasn’t there for some sale–not in itself. I mean, I was curious what was left, what they’d have. But in a way, I wish that I hadn’t gone. At least the previous time in the store, it still seemed like a store instead of a garage sale. This was pitiful–it was sad. To see a once-great toy store full of all sorts of toys reduced to whatever it was. It made my personal toy collection look like some huge thing, and the store selection look like some cast-off. And I felt bad as well, hearing other people muttering about the lack of selection. Like they were inconvenienced by there not being MORE still there for up to 90% off. Like they’d been slighted. Yet, all these employees hustling about–it was very nearly the end for their JOBS. I’ve been laid off twice myself in the span of 18 months, so I can sure as heck appreciate the “losing a job out from under” one’s self, but at least in my experiences, it’s pretty much been a matter of cleaning out my workspace and leaving–and that’s that. I’ve never had to hang around for weeks or months, doing my job as if everything’s normal, dealing with people as if everything’s normal. I can’t imagine what it must be like to have to put on the usual, cordial front, to be working RETAIL, being nice to customers, while watching my job drain away…even as customers are out for a deal. There was virtually nothing left on Wednesday…because the chain filed for bankruptcy. Is closing. This liquidation sale’s been going on for several months. Employees are out of their jobs…and people were upset because they thought there should’ve been a bigger selection? I was there for the nostalgia of walking into Toys R Us at all, for the nearly-last (or as it’s turned out, THE last) time. I bought what I bought to “buy SOMEthing,” since I was there, since I had for some reason grabbed a cart. I could have gone one last time today…but I opted not to. Maybe we’ll see a return of the brand someday–look at Hostess. But in terms of “continuity” and such…this is it. 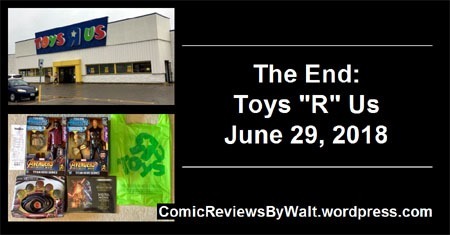 It’s depressing to see a toy store go out of business. I remember the same feeling when all the KB Toy Stores disappeared. We don’t have this chain near where I live but I would take my son every year after Christmas and his Birthday to the one in the city so he could spend his money. He cried when he heard the store wouldn’t be there anymore.